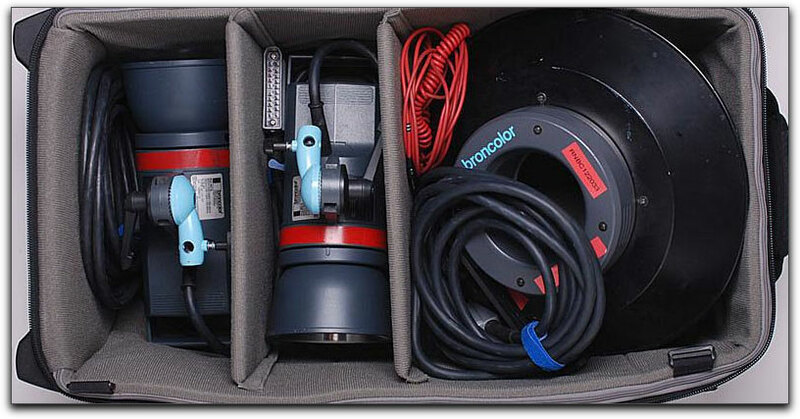 What do you do when your rolling camera equipment bag simply can't be stuffed any fuller than it already is? Why, get a larger one! We've all done it, filled every nook and cranny of our gear bags till they were bursting at the seams and then hoped they would fit into the overhead of the airlines. On my last trip to Roatan, I believe my Think Tank International carry on roller weighed more than any of my checked baggage and was lucky that it still fit in the overhead bin of the airplane. Sometimes we have a shoot that demands more equipment than can fit into any carry on and that is where Think Tanks Logistics Manager roller bag comes to the forefront. With its external dimensions of 15.75" W x 30" H x 11.5" D and internal dimensions of 13.75" W x 27.5" H x 8.25", the Logistics Manager is far too large to be considered as a carry on for air transportation, and while it is certainly sturdy enough to be checked in at an airport, I would not recommend doing so since I would never trust TSA and baggage handlers who couldn't care less about my precious equipment at any airport. 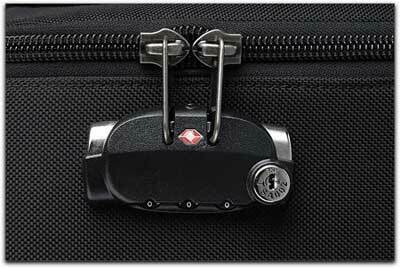 Never the less, a TSA combination lock secures the main zipper while another TSA lock and cable is found in the back pocket. 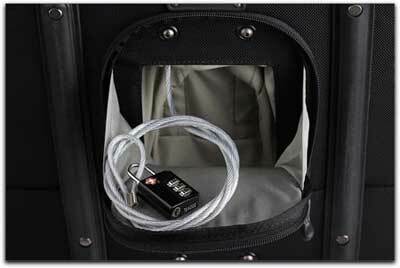 This cable/lock combo allows you to tether the Logistics bag to any secure pole, seat or fixed object so that it cannot be stolen while your attention is diverted while on a shoot or at an airport. Where the Think Tank's Logistic Manager shines is that it is large enough to store and transport all types of gear to most any location. 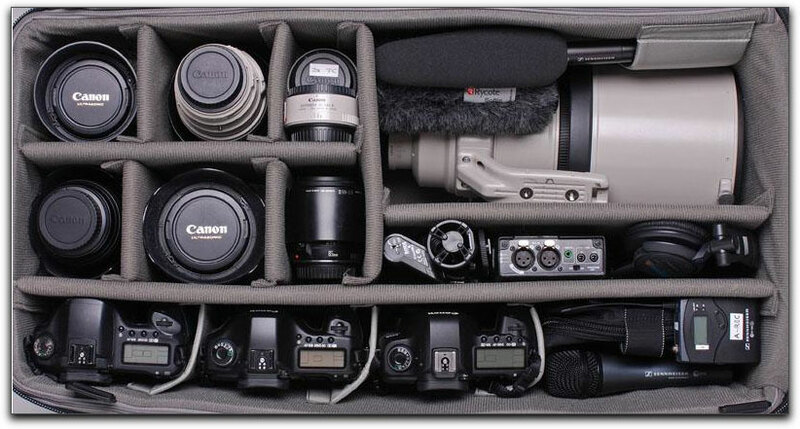 You could easily fit a small tripod, lighting equipment, camcorders, HDSLRs and various mounts within knowing that they will all be protected from bumps, bag drops and whatever else you may throw at them. If your tripod or light stand is simply too large to be placed inside, two external holders come standard and fit the Logistics Manager like a glove and are easy to attach firmly to the bag. I use Think Tank's largest Bazooka bag for my tripod and it attaches to the side of the Logistics Manager just as easily. 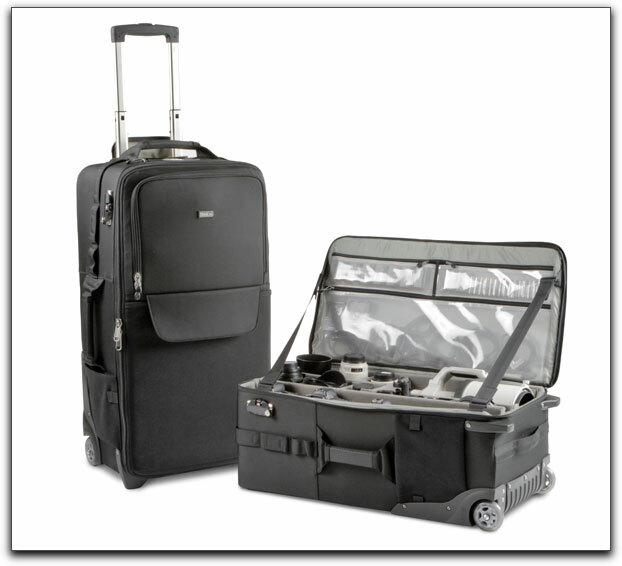 If you need to transport the bag during a rainstorm a full sized rain cover also comes standard with all the Think Tank Bags I have reviewed and they continue to provide one with this Logistics Manager Rolling Case. There is one main zipper that opens the case horizontally and two adjustable straps that keep the top piece at roughly a 90° angle preventing the bags top piece from falling over and laying on the ground, taking up more room when space is limited. 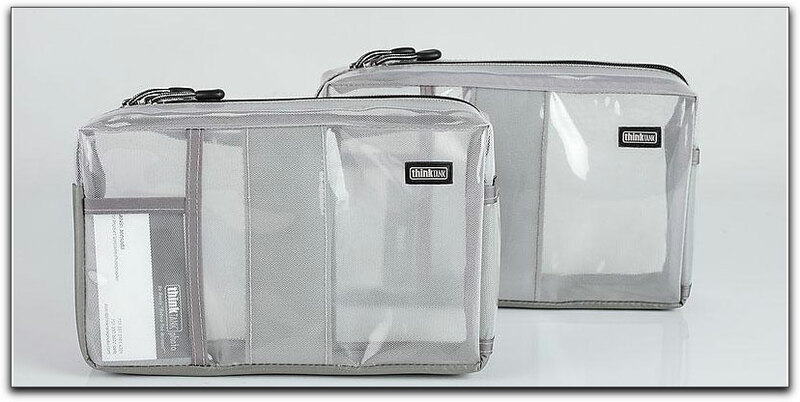 This very large piece doubles as a small gear organizer containing one full sized, one end to the other, clear protective pocket as well as two smaller, clear pockets. These clear interior pockets enable you to see just what piece is in which pocket. Clear pockets prevent having to fumble around trying to remember where you put each battery, cable, mic or whatever; they are in plain sight for you. Additionally, the Rolling Logistics Bag provides two purse sized bags, each with its own small external pocket and internal divider for additional storage which makes for easy transportation of any items you store within so that you do not have to roll the whole bag ten yards here and 15 yards there. You may be at a shoot, all set up but just want to use these two bags for extra batteries or cables. Leave the Logistics bag back in the van and just have these two bags close to hand. Good thinking and an extra bonus on Think Tank's part. 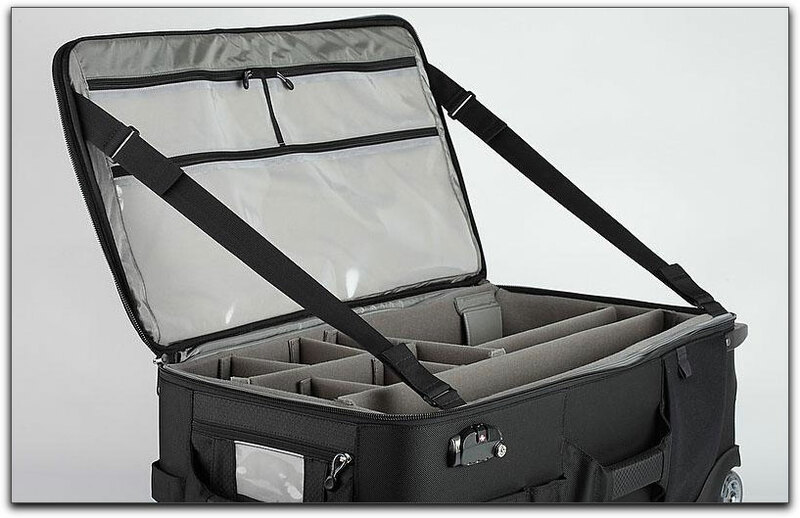 Additionally, the Think Tank Logistics Manager Rolling case has two large external pockets on the front, the lower one, made of stretchable material, is closed by a Velcro flap and can easily fit a laptop computer with easy access. The pocket can also be used for large, awkwardly shaped equipment such as Magic Arms, extension cords and some folding reflectors. The top zippered pocket will hold, via several smaller internal pockets, any traveling documents, batteries, cables, or other small pieces of gear. On the external side is an additional and good sized zippered pocket as well as a smaller stretchable pocket beneath it for storage of quick access items. There is even a small zippered pocket at the top of the case when it is stood vertically. Saving the best for last is the great amount of room in the main case. The Logistics Manager has room for several camera bodies, lens, camcorders, small to medium soft-boxes, stands and whatever else you might need it for. 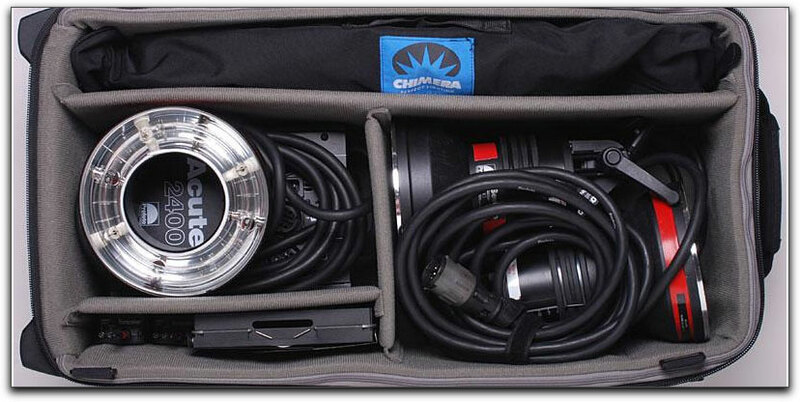 I think the only thing I couldn't put in this case is my large boom pole and a couple of my very large studio lights. The Think Tank case comes with an overly generous number of different sized protective dividers for use within the case so that each piece is completely protected from bumping into another stored piece. How you configure the Logistics Manager's internal setup is completely up to you and your equipment needs, but you can bet that you will have more than enough dividers to meet your requirements and then some. 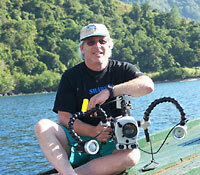 Configuration possibilities for most any filming equipment are fairly limitless. The Think Tank Logistics Manager Rolling Case comes with its own serial number. This is an added service provided by Think Tank should the case ever be lost or stolen and then recovered. Once Think Tank is notified of its recovery they will then send you the contact information so that you may arrange for its recovery and transportation back to you. Think Tank does not take actual possession of the case but it is good to know that if they are notified, then you will be as well. Thus, before using the case, it is best to go on line and register your serial number. A price of $499.00 is not exactly inexpensive but in this case you have to ask yourself. Do you really want to have to buy a cheaper quality and priced case every year or so because they couldn't stand up to the rigors of location transport and shooting? The Think Tank Logistics Manager Rolling Case is backed up by a full, no questions asked lifetime warranty so buy it once and it will probably outlive you. The large main case zippers attest to the thought and quality of all the bags I have reviewed from Think Tank as the sewing thread is actually melted or 'fused' with the plastic coil for considerably superior abrasion resistance. While the Logistics Manager in my possession is still brand new, it inherits the same high quality of my International Rolling Case that has been through a great many airports and countries world wide and still looks and performs as new. In this day of economic recession and uncertainty, it is the wise individual who will make any purchases with forethought to the future. 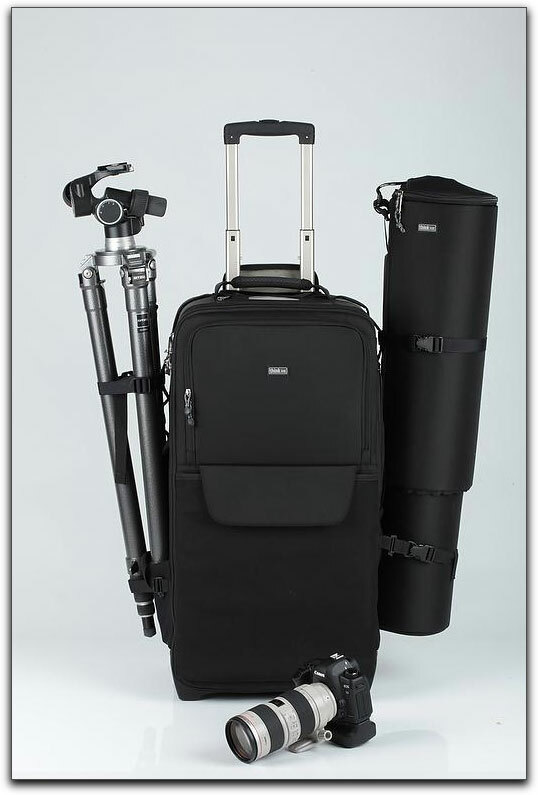 That the Think Tank Logistics Manager Rolling case will meet the demanding needs of any professional photographer or videographer, no matter what your status, hobbyist or pro, I don't think you will find a case better made or more protective of your valuable equipment.